Writing columns talking about how good the fishing was during the week, followed by talking about how bad the weather is going to be during the weekend, gets old really quick. And looking back over the headlines of my last five columns, all of them refer to either good pre-storm fishing or good post-storm fishing. Well, I hate to tell you but we can add this one to the list as well. 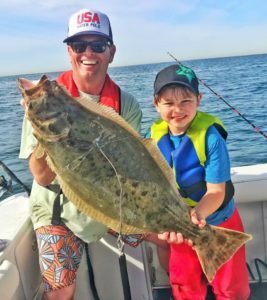 Starting with the good news, we had surprisingly good coastal fishing over the weekend and earlier this week. 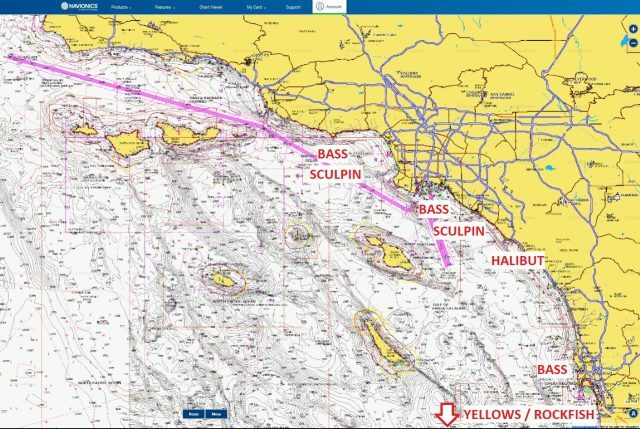 While the Navionics Chart may seem unexciting, compared to what we’ve seen in previous months, there’s actually a lot of fun fishing to be had. 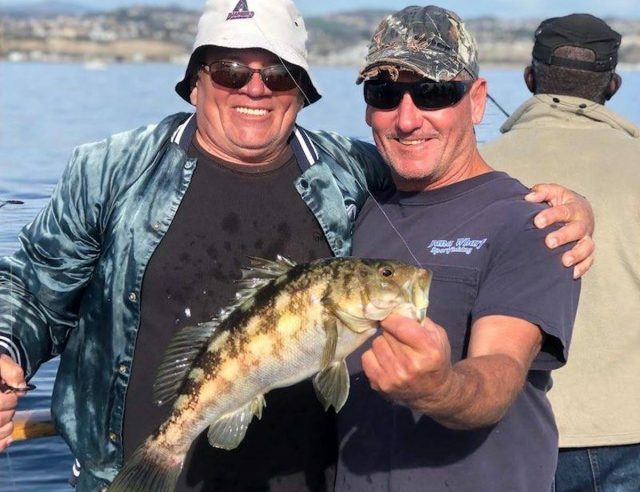 I fished sand bass and calicos in San Diego on Saturday and found wide open action in several areas with three of us totaling 50 or 60 bass before noon. Now for the bad news. 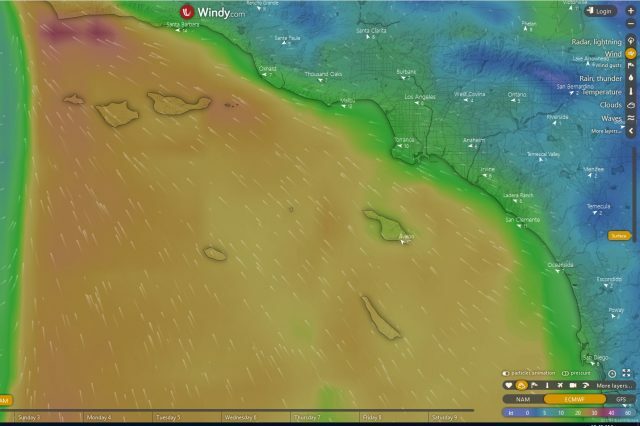 This is what the SoCal Bight is going to look like on Saturday morning. That 20 knots of south east wind blowing along the coast is going to guarantee that you’re most likely not going fishing this weekend even after the rain stops. The wind is going to continue to blow through the early part of next week but switches to offshore mid-week. Next weekend’s forecast is far enough out at the time of this writing that I don’t trust it but it’s looking like it might be windy too. If you’re dying to go fishing, I’d recommend trying to get out there sometime mid to late next week, but in the meantime we should keep our collective fingers crossed that the wind and rain give us the next few weekends off. 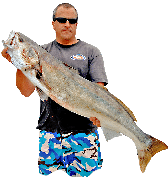 I’m going to try and squeeze in another trip to San Diego sometime next week to pre-fish for the upcoming SBS bass tournament there on the 16th. If you’ve been thinking about giving tournament fishing a try, you can sign up for their rookie and family division, where you won’t have to compete against the guys that have been doing it for years. I met quite a few of my readers at the last event and all of the guys that were new to it said that they had a great time and that it was a good experience. If you’d like to learn more you can get the details at the SBS website. One last thing, I’ve been getting lots of questions from readers who are curious about whether they would benefit from getting a Navionics chart on their boat. The answer is “of course” and if you’re one of those people on the fence about getting a chart, they are currently running a trade-in program that allows you to send in your old chart card and get up to $75 back on the purchase price of your Navionics Card. You can find out more details here.